First I have to tell you a bit about a unique person and the tower he built, as this is how I came across the existence of the many millions years old village. 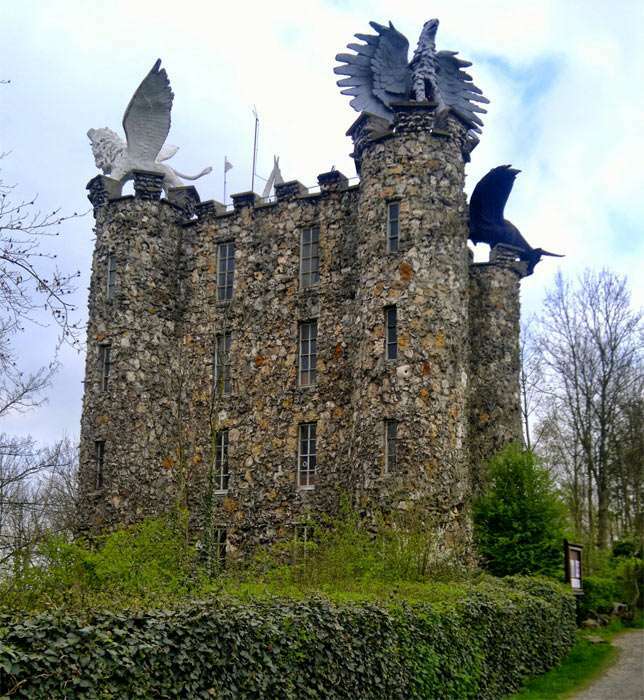 In the village of Eben-Emael (in the province of Henegouwen, Belgium), there is a strange tower built by an artist, Robert Garcet (April 12, 1912 – December 26, 2001). I visited it twice, and it is a truly enigmatic building. Robert Garcet built the tower all by himself in the early 1950's. It took him 15 years to finish it (1948-1963). He died in 2001 at the age of 89. The building is entirely built out of flint stone. Flint is common in the area, and has been mined there since the 1930's. 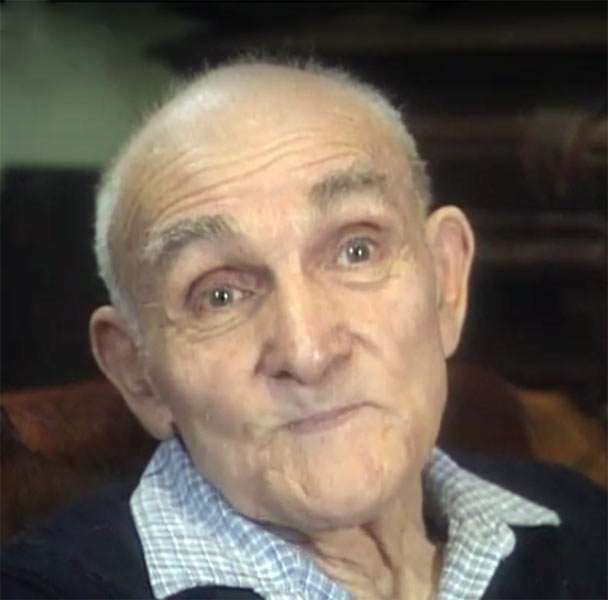 Robert Garcet was not exactly an ordinary person. He was an artist and it shows in every single aspect of the tower he built. He was a builder, a sculptor, a stone cutter, a painter, a writer. The tower now serves as a museum, dedicated to garcet's art and archaeological finds. It displays archeological, paleontological, and geological interests of Garcet, whose findings and ideas were not accepted by conventional scientists of his time. Garcet was very religious, although he was against the religious institutions and the workings of the government. 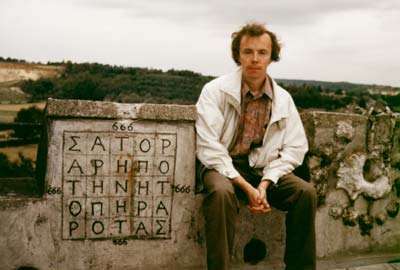 He was also into spiritual numerology. 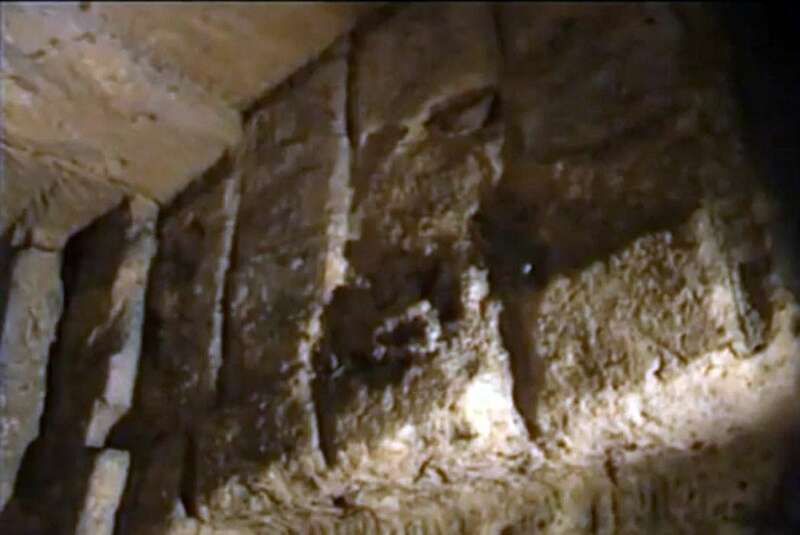 The tower has seven levels, five levels above ground, and two levels underground underground. The tower itself is of a square of 12 meters (40 feet) on each side, held up by four towers on each corner. Garcet designed the tower so its dimensions would correspond to ancient systems of measurement. Each measurement in the tower is symbolic. In its totality the tower represents mankind, as in the Revelation of the Heavenly Jerusalem. 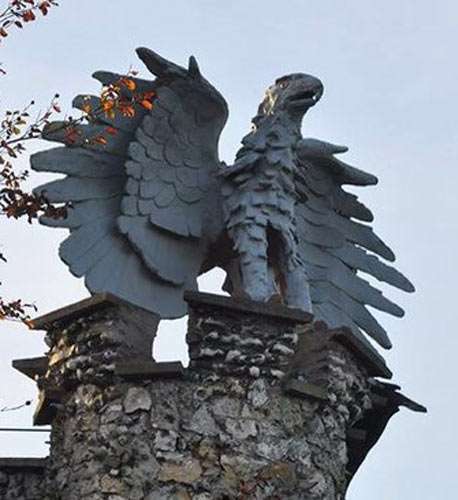 Garcet was heavily into Biblical symbolism, and that shows throughout his entire tower. 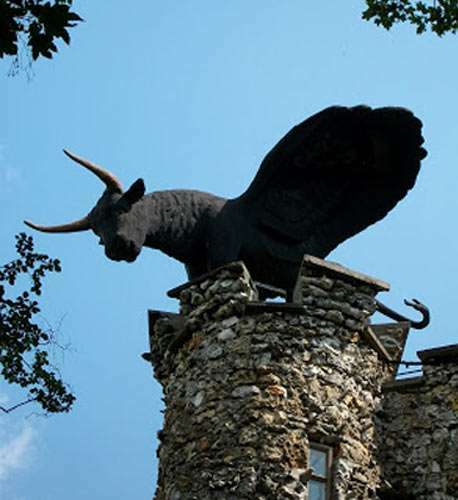 On top of the tower are four stone sculptures of four animals, representing the four Living Creatures of the New Testament: Man, the Eagle, the Ox and the Lion. For the more esoteric, they also represent the Four Elements. 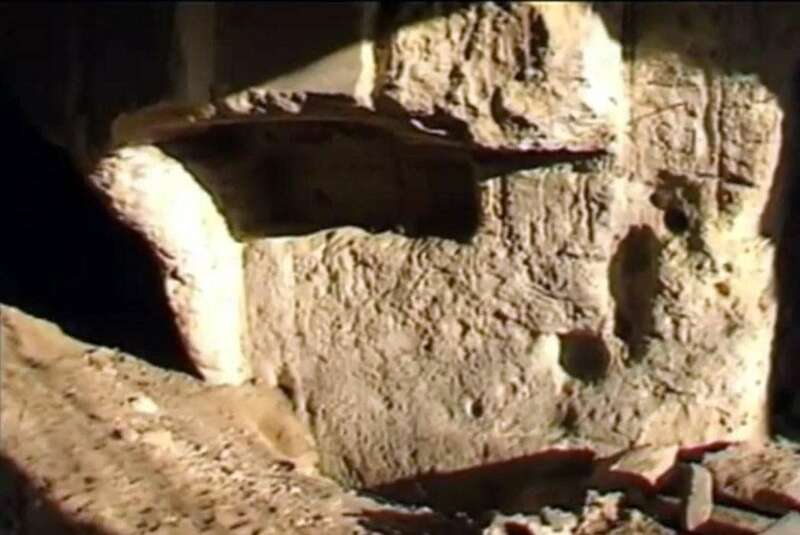 Entrance to the tunnels, starting at the lowest level of the tower. 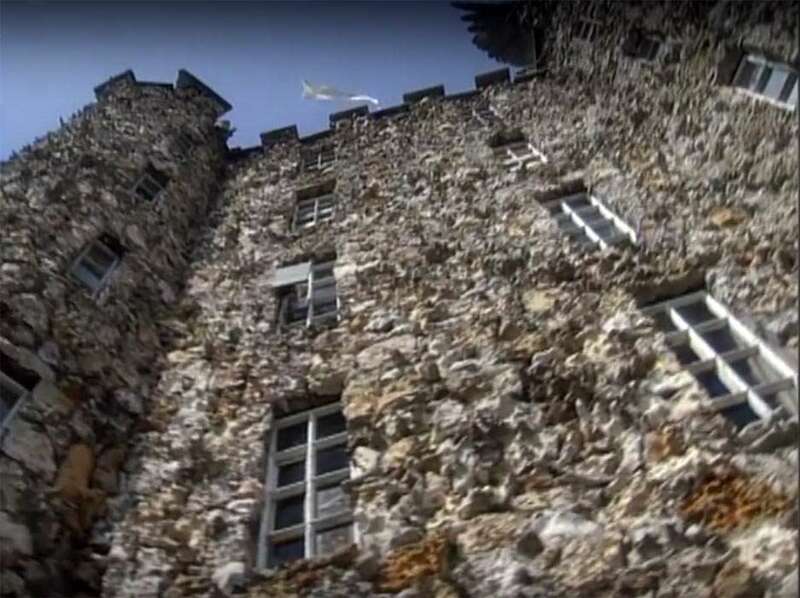 Unfortunately I was not able to have a look in the lower levels, as at the time of my visit, vandals had broken into the tower and caused damage in the lower levels. 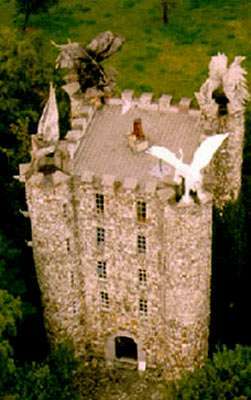 Most interesting is that the tower has two lower levels and sits on top of an entrance of a labyrinth of ancient underground passages. It has been rumored for a long time that there are many underground tunnels in this area where Belgium, The Netherlands and Germany meet. Some of the tunnels are so long long that nobody has ever found the end of them. 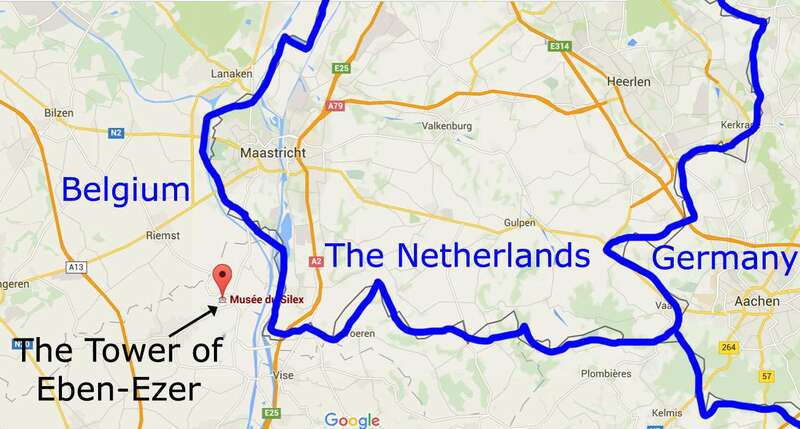 They also run under the present borders of those three countries. 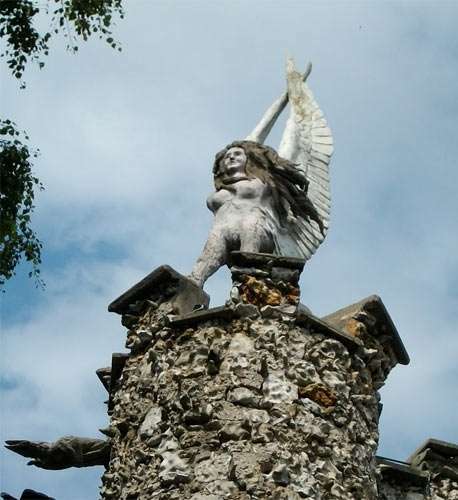 In the last centuries there has been a lot of mining of marl stone a little bit up north, just over the border of Holland around the city of Maastricht. 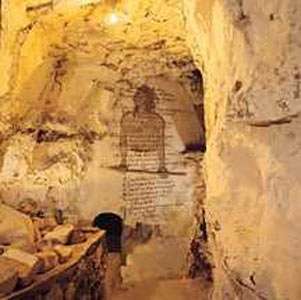 I once went to visit one of the famous large marl stone mining caves. It is both as large and complex as a labyrinth, so that the guides have to undergo special training to find their way back in the dark. 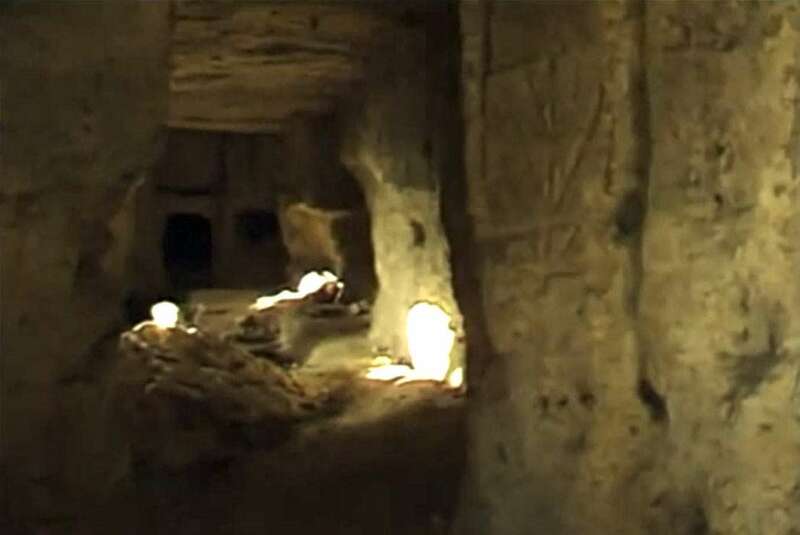 You never know if the flashlight will fail while you are guiding a group of tourists deep down in that labyrinth. An ordinary person will have very little chance to find his way out. It has happened in the past that people went in and were not seen anymore. 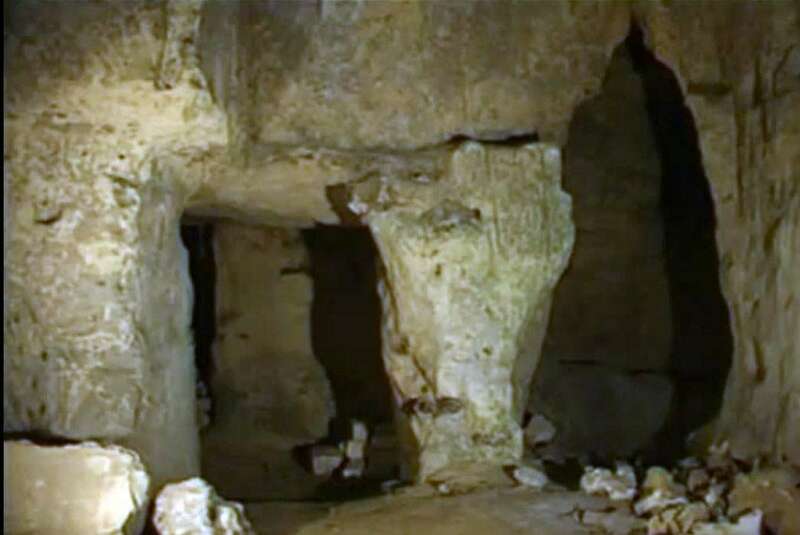 Underground tunnels and caves are present in the area of Eben-Ezer, as the result of old and even ancient flint mining. 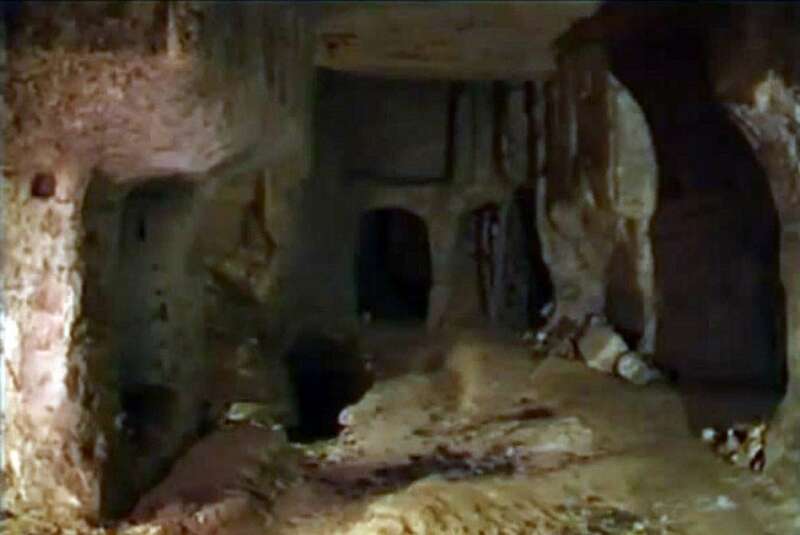 Robert Garcet went exploring in this subterranean realm, and went even deeper than other people had ever done before him. This way he found many fossils, prehistoric tools, and rare geological formations. Garcet claims that he had discovered two hundred new organisms, which he studied and drew pictures of. Mostly small insects and crustaceans. 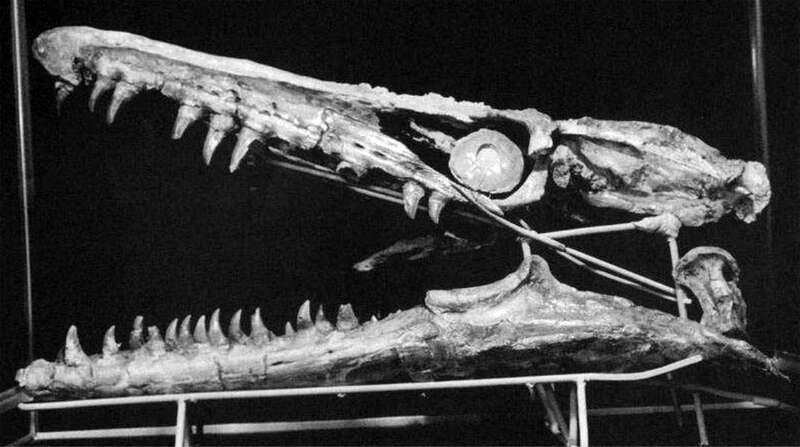 However he also amassed a remarkable collection of mosasaur fossils from upper Maastrichtian strata in the Eben Emael area (near Liège, Belgium), and just south of the type section of the Maastrichtian Stage at the St Pietersberg (Maastricht, the Netherlands). Unfortunately the Belgian scientists were not interested in his finds. 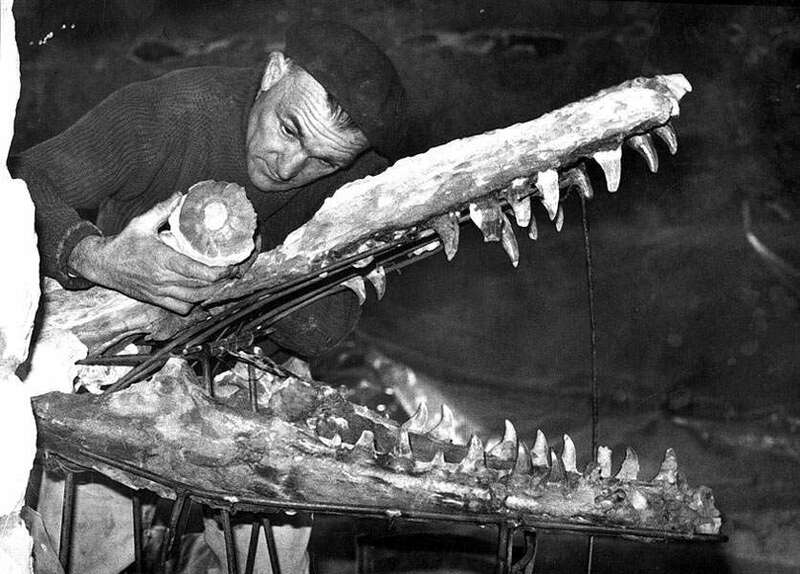 The skull of a Mosasaurus discovered by Garcet. 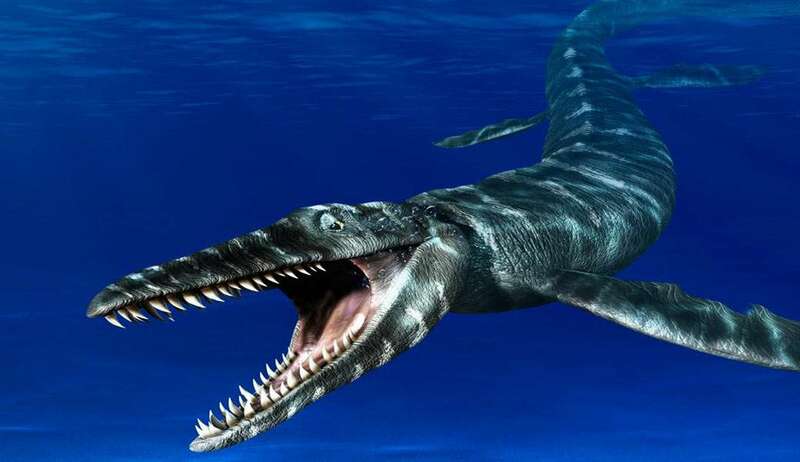 An artistic representation of a Mosasaurus. 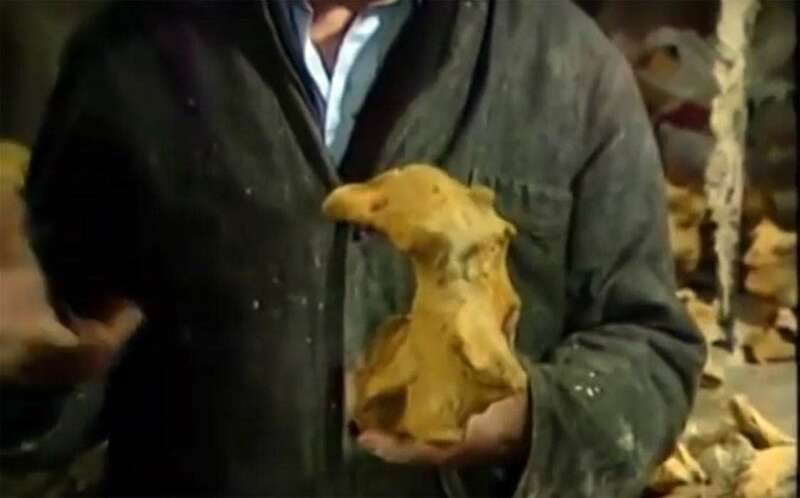 When he explored the underground flint mines and tunnels in the neighborhood, Garcet found stone toys and figurines made from flint and other stones. Some looked like stone dolls, made from rounded flat stones with engravings. They are all very primitive looking, and are unlike what conventional archaeologists are used to. 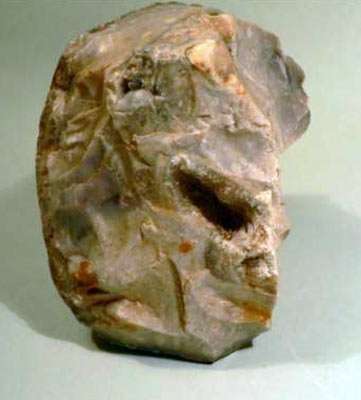 One of the flint pieces Garcet found, that has the shape of a face. Flint is a hard, sedimentary cryptocrystalline form of the mineral quartz. Scientist don't quite know how flint stone was formed. It is thought that it occurs as a result of chemical changes in compressed sedimentary rock formations. A gelatinous material fills cavities in the sediment, such as holes bored by crustaceans or molluscs and that this becomes silicified. It might have been organic in nature before it turned into stone. On the international hardness scale, flint ranks 7 out of 10, where diamond is 10, so it is harder than most materials commonly encountered in the natural environment. Flint was used in the manufacture of tools during the Stone Age as it splits into thin, sharp splinters called flakes or blades (depending on the shape) when struck by another hard object. Other than that flint stone cannot be used to cur, saw or sculpt it into any form, because it just splinters apart. So Garcet was wondering how did the builders of that village manage to shape the flint rock in smooth surfaces. 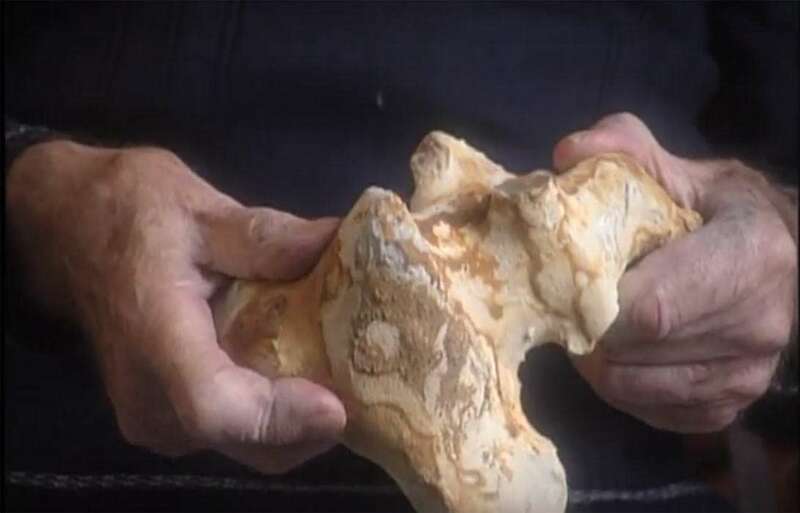 Also he found many rudimentary flint sculptures that were actually molded as if by hand. Some of them had broken in two and the pieces had been attached together. Others were two pieces that were molded together into one piece. He also had a piece of flint that was cut in two lengthwise, as if by a knife. A flint nodule, but molded by hand. Garcet concluded that at that time, 70 million years ago, flint was actually a soft material that could be molded by hand, a conclusion that scientists did not accept. I think the reason that scientist do not accept that these flint objects were molded by hand, and represent animals and other figures, is that these flint items were crudely made and do not reflect the more sophisticated artistic object made by ancient humans. Isn't it possible that some other primitive, but intelligent species were the creators. Beings that were not that artistically sophisticated but were still able to shape the flint into objects that were easily recognizable to them: simple faces, animals, dolls, etc. Flint molded into a face. 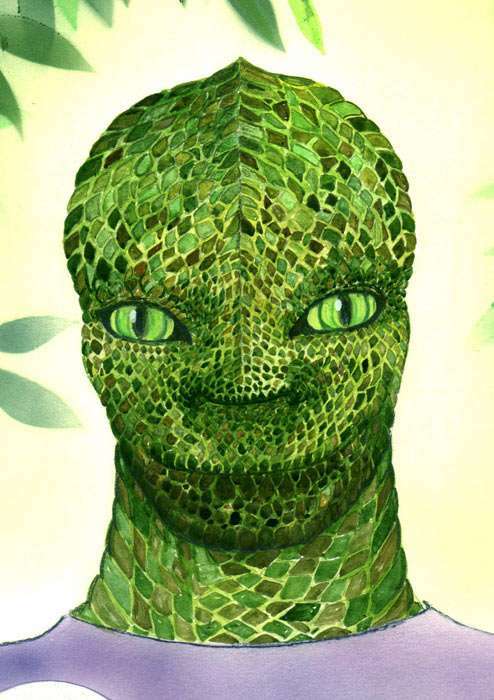 Flint molded into a reptilian being. 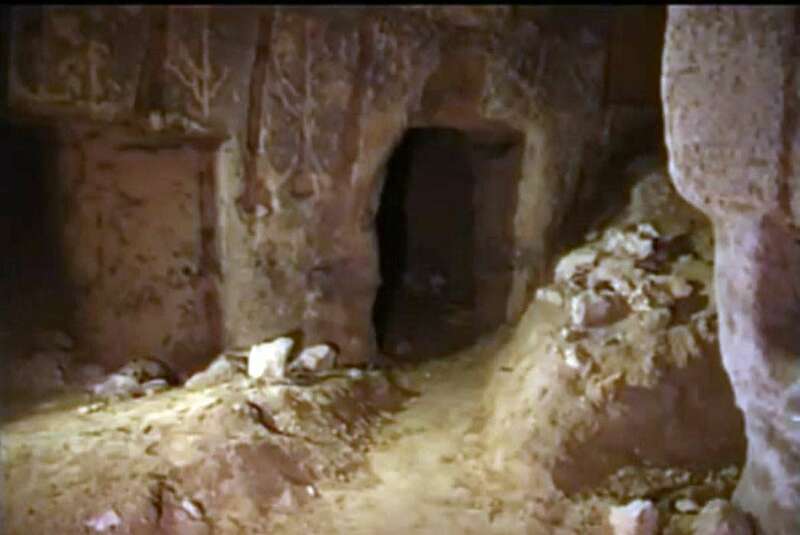 Some distance from where his tower is, Garcet found an underground village in 1972. He called it Thébah. This village, he claims, was cut from the rocks a long time ago. 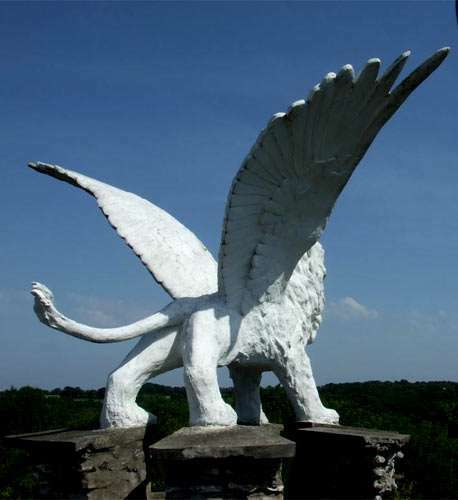 It was located about two kilometers south of his tower, in the valley of Geer and Berwinne. Thébah was the center of a much larger area of inhabitants, the size of a province. The part of the village he explored was spread out over an area the size of two hectares (= 5 acres). 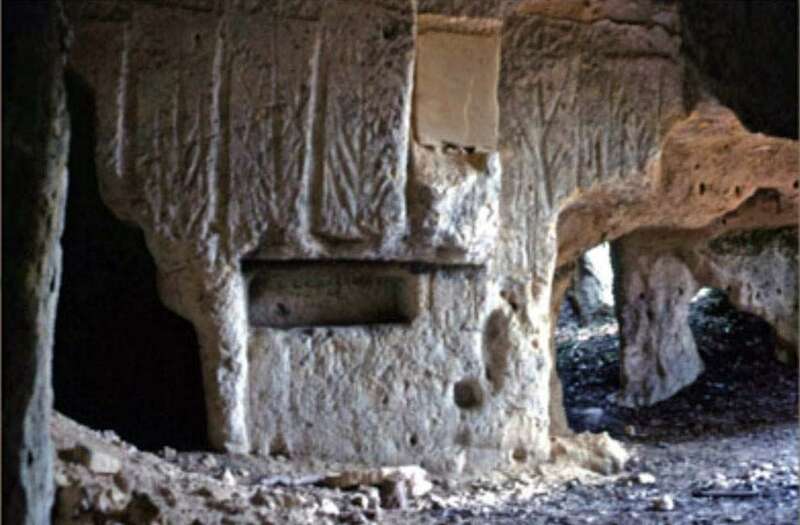 Garcet noticed that the entire underground village was nicely cut with straight walls, tables and benches, and ornamental decorations incised in some of the walls. He thought that the main streets were once open to the air. On top of the village are now three layers of ocean deposits, showing that Belgium has been covered three times by the ocean. This means that the village existed some 70 million years ago. In archeology this is unheard of. 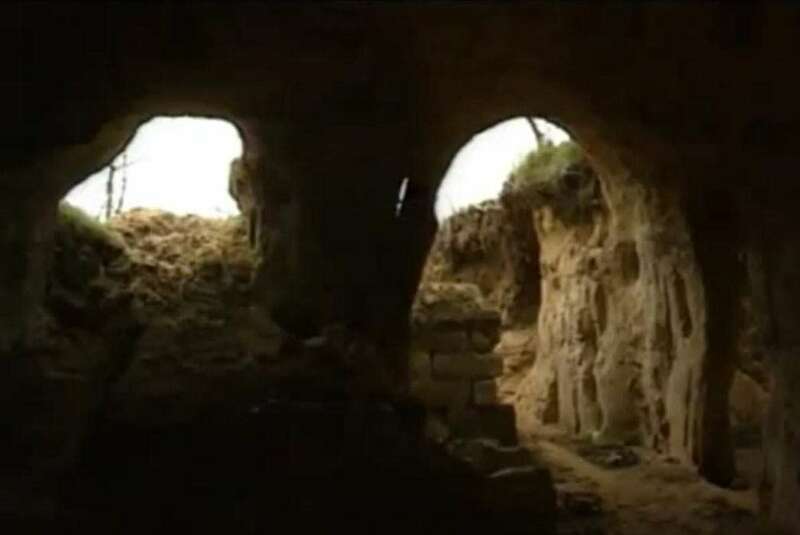 He invited the Belgium archeologists to come and have a look for themselves, but none of them showed up. Unfortunately, in the late sixties, a nearby flint mine bought up the land above it, and in 1987 it blew up the area where the underground village was situated. A real heart breaker for Garcet. 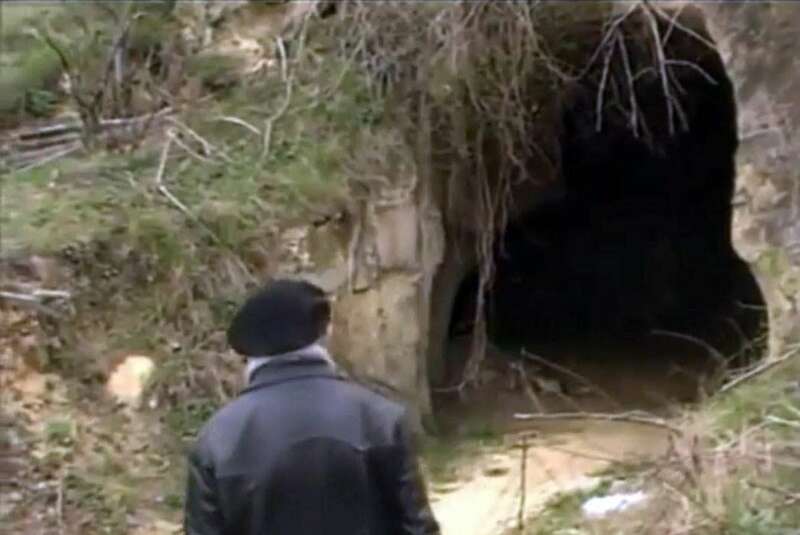 I have seen the video he made of this underground village in the early sixties. 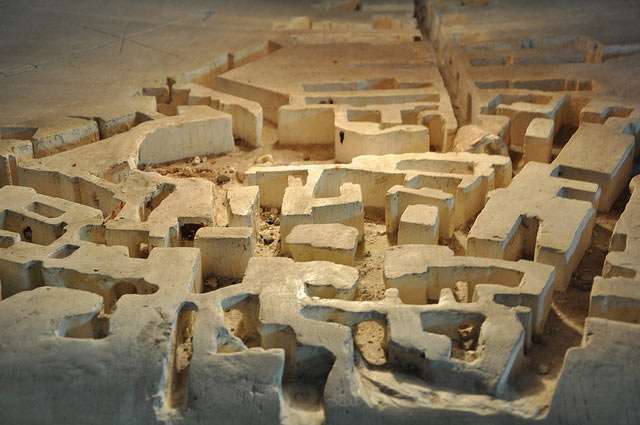 He also had made a scale model, showing a principal street with small side streets, and the many rooms. 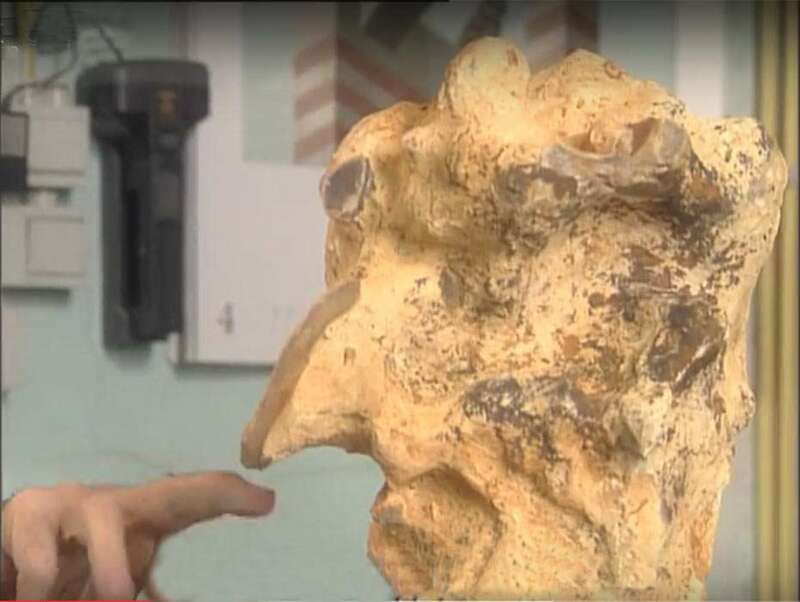 Garcet made a scale model of the 60 million year old village he found, deeply buried in the ground, but reachable by underground tunnels, before the whole area was blown up by the flint company. 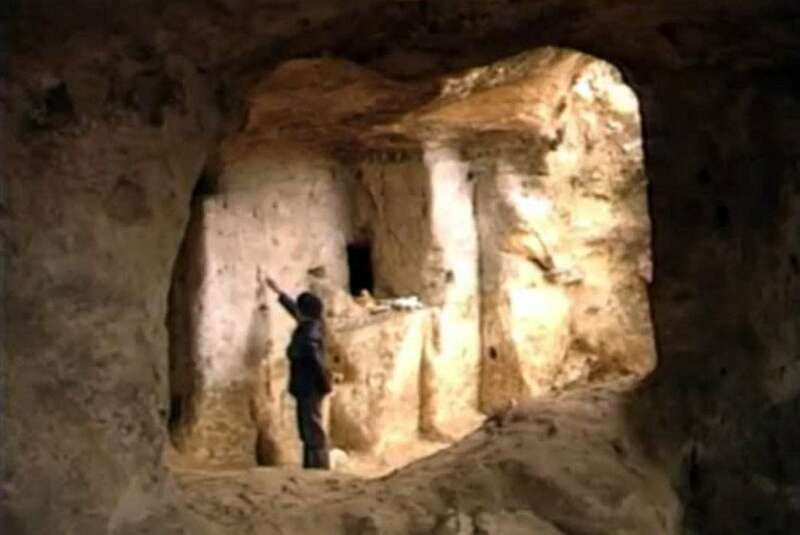 Something to consider: if the village is 70 million years old, that means it was not occupied by humans (Homo sapiens), because they are around for only 200,000 years, at least according to the archaeologists. The Neanderthals are 600,000 years old. Homo erectus is 2 million years old. The oldest near-complete skeleton of a human ancestor was the 3.2-million-year-old Australopithecus afarensis skeleton known as Lucy. So... who was living in that village? 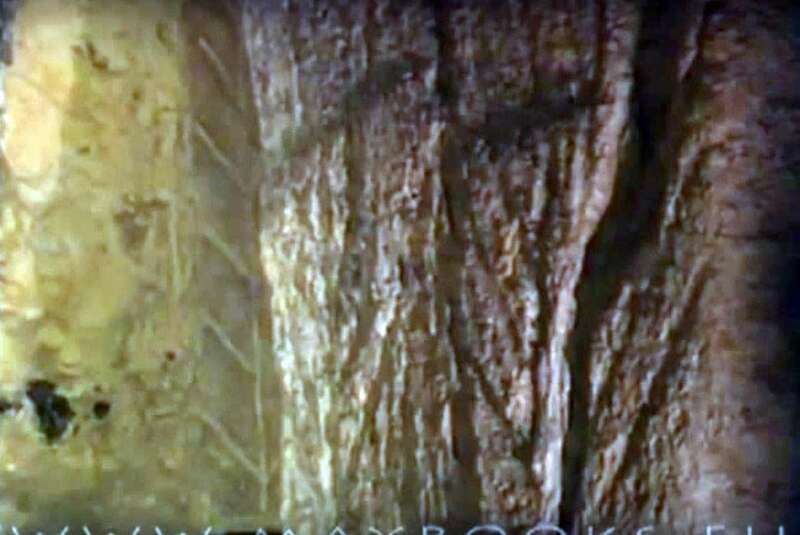 The following are pictures from a video documentary and book by Markus May, called Die Steine der Apokalypse, Robert Garcet und die Legende vom Feuerstein. What you can see in those pictures is the small portions that remained after the flint company had destroyed the village. The following are pictures from Musee du Silex. Notice the ornamental wall carvings. It is unfortunate that the Belgian scientists and government never wanted to investigate what Robert Garcet had discovered, and that the flint mining company put profit before a unique archaeological discovery. Most of the underground village is gone now. 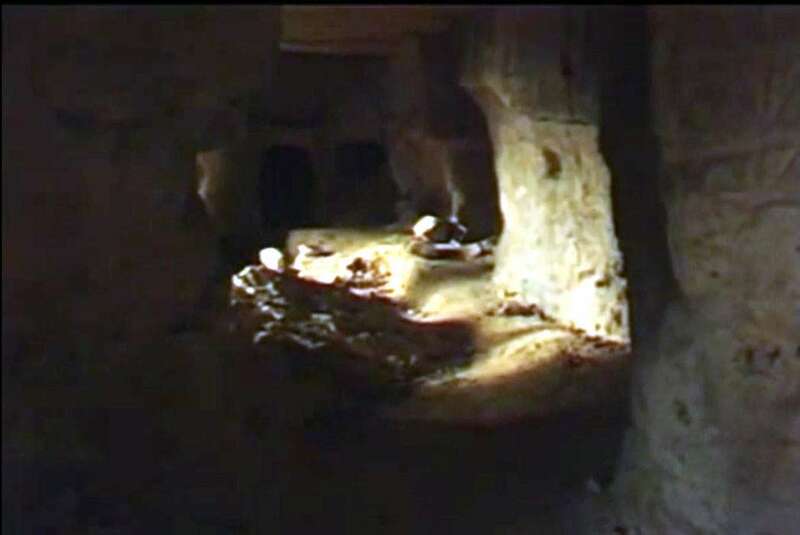 Nevertheless it raises an important issue about what beings actually used to live underground on this planet. 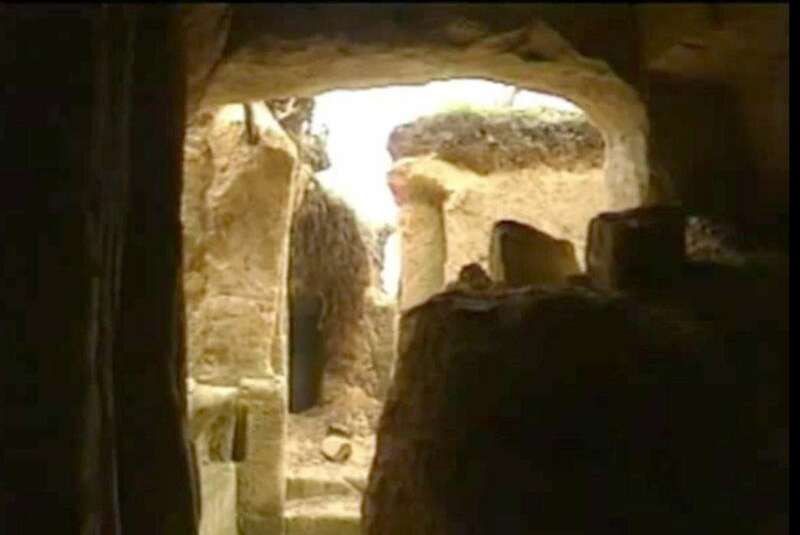 Thébah is not the only underground village. 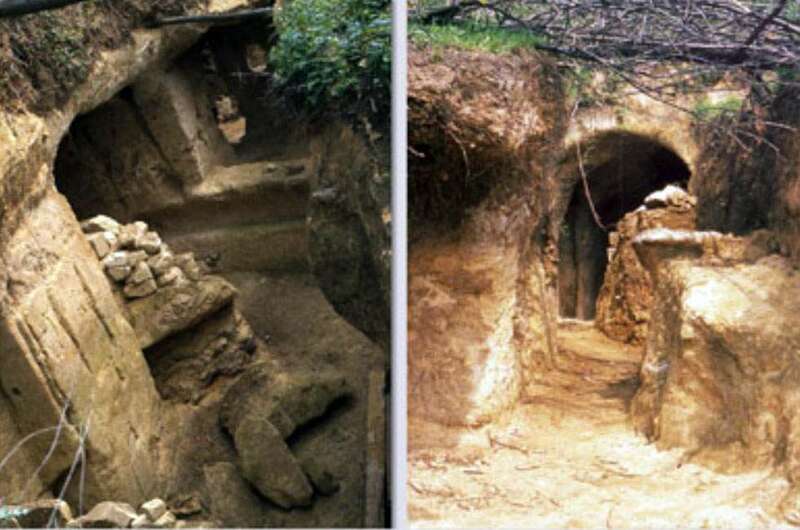 Large underground villages, cut out in stone, can be found all over the planet. 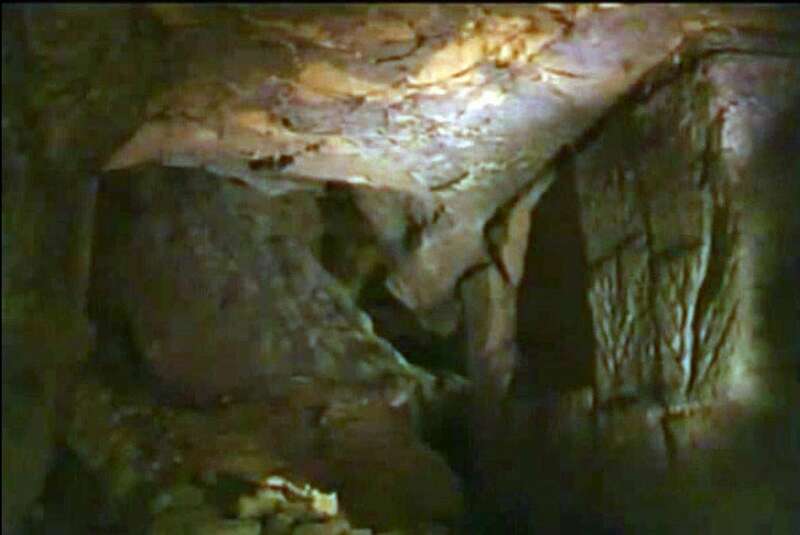 Some are now exposed to the surface because of heavy erosion of the soil and rock around, indicating that they must be millions of years old. 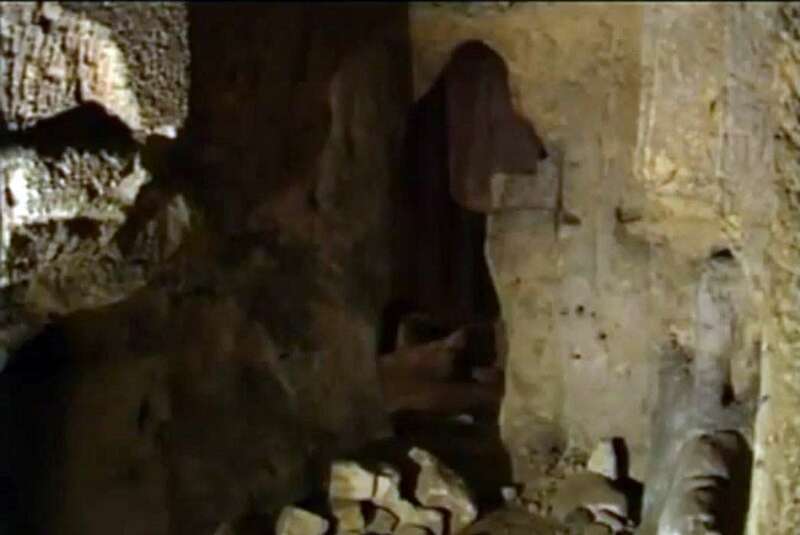 These were not made by primitive people, as such a extensive labyrinth of rooms and corridors must be carefully planned, especially because they usually have many levels underground. 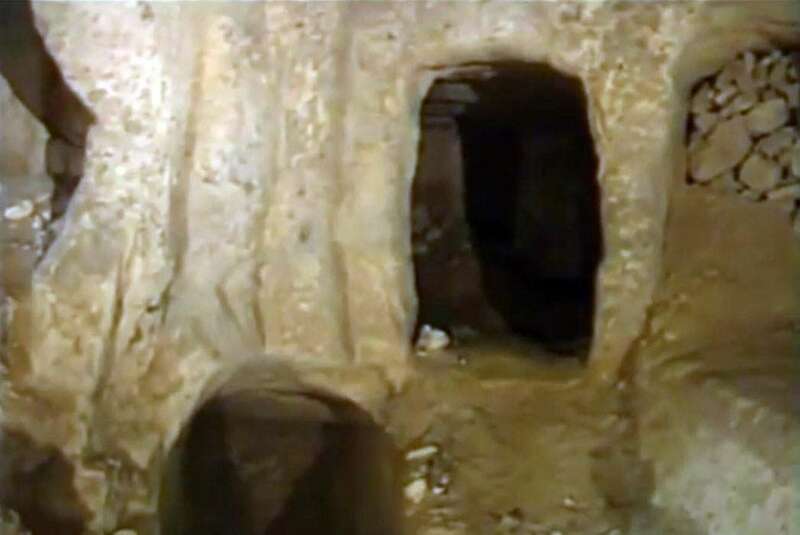 They also have access to drinking water by deep shafts leading to underground streams, and many ventilation shafts. 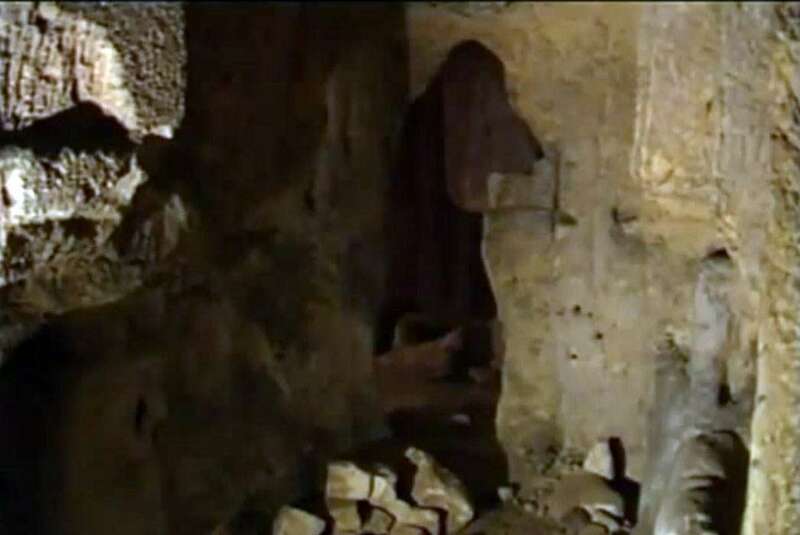 How did these beings illuminate the dark rooms they were in? 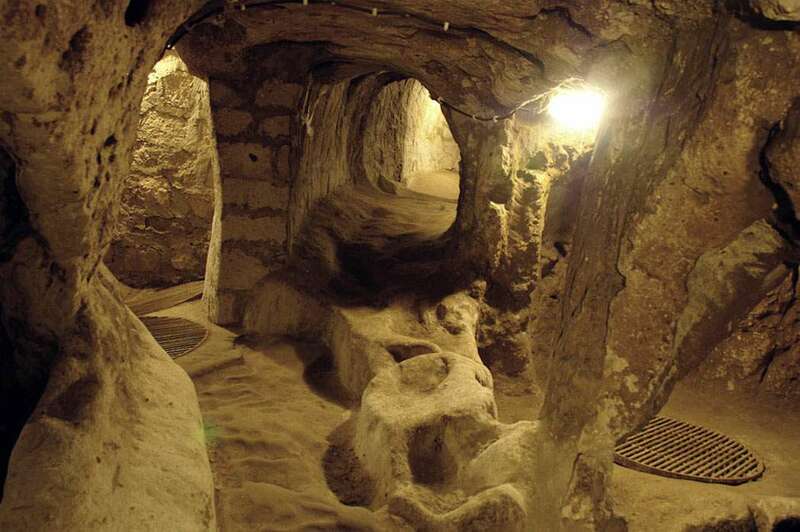 If they had, for example, oil lamps, they must have had large amounts of oil, because some of those underground cities had many thousands of inhabitants. 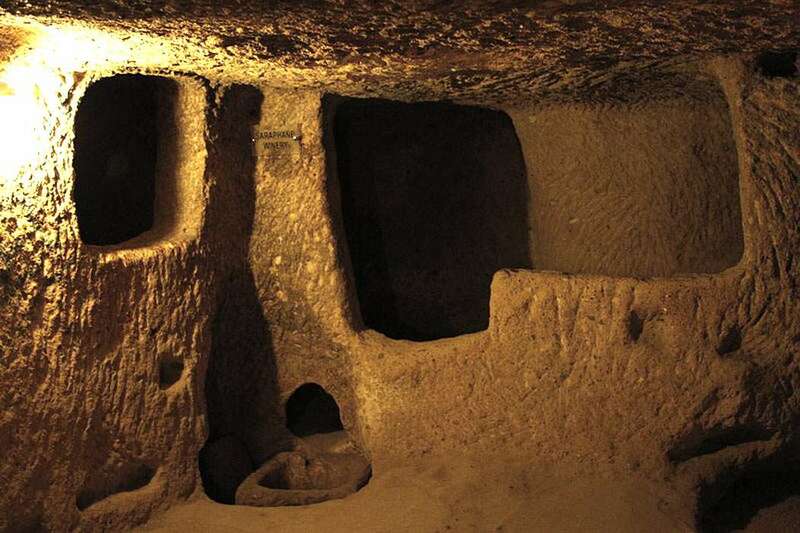 The now famous Derinkuyu underground city in Turkey sheltered about 20,000 'people'! Unless, of course, as I mentioned earlier, those beings had night vision, eyes with adjustable pupils. This is not known to humans, or hominids, so are we looking at another intelligent species? 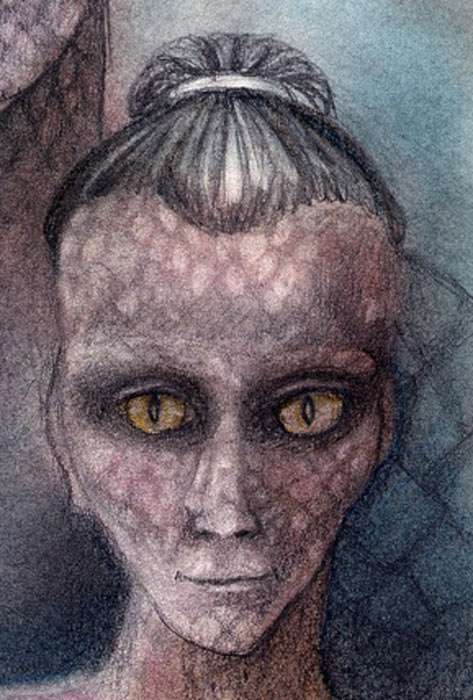 Such as the Reptilians, or extraterrestrials which have night vision? Of course, these do not exist according to the scientific and governmental establishment...or do they? Our scientists and religious institutions told us that humans are the only intelligent beings in the universe. The universe with it billions of galaxies with billions of stars and planets each is just a wasteland, a desert, no life out there. Well, the extraterrestrials don't care about what those scientists think, they have been here since the beginning of the planet. But that is another story.